Interested in learning about the night sky? We have several different star gazing events you can participate in. They are fun, free, and very educational. 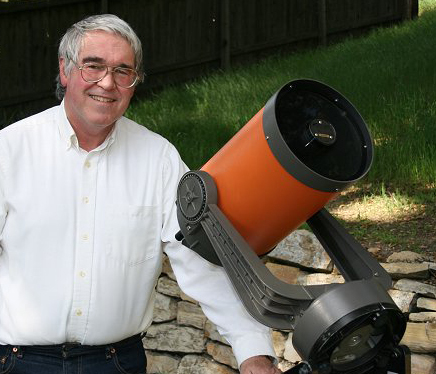 We offer several ways to observe the cosmos for the total beginner through experienced astronomer through our many different events, including Sidewalk Astronomy, Dark Sky Star Parties (see below), Solar Viewing opportunities, Beginner Astronomy classes, and more. Check the calendar for the latest updates and location info. The information below is for the Dark Sky Star Party events, one of our most popular events we host. The Dark Sky Star Parties are star gazing events we hold once a month when the moon is new (or close to it) so we can see as much of the sky as we can. They are very dark nighttime gathering to view the cosmos through telescopes and binoculars. For some people this is one of their high points each month! If you’re got a large, bulky telescope, please arrive before sunset to set up. If you arrive after dark (e.g. you need headlights to see the road), DO NOT drive toward the telescopes! Park in an area that doesn’t disturb the night vision of the astronomers. It is a very friendly atmosphere. The astronomers who participate with their telescopes are always happy to share their passion for astronomy with each other and with anyone who decides to join them for the evening. The public is welcome to attend, learning a little something about telescopes and the skies and hopefully developing an excitement about astronomy. 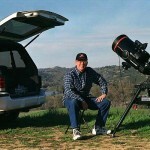 North County Star Gazing Location: Located at the Santa Margarita KOA Campground on “Star Party Hill”. 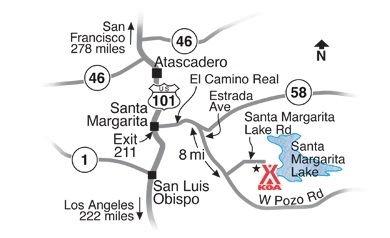 From Hwy 101, take Exit 211 for Santa Margarita Lake. Go 1.8 miles through the small town of Santa Margarita. Turn Right on Estrada Ave./Highway 58. Estrada Ave. becomes “J” St. which turns into W. Pozo Rd. Go 1/2 mile up the hill. The KOA will be on your right. Go past the main office and look for “Astronomy” signs on your right directing you to the observing site. Look for telescopes on top of a small hill. Park at the BOTTOM of the hill. Do not drive up the hill unless you have a telescope. It’s a five minute walk up the hill. Be sure to get on our email list so you can get the latest information for star gazing! Watch the video below for a bird’s eye view of our friendly astronomers setting up for a summer star gazing session! 1. If you plan to participate with a sizable telescope and need to setup next to your vehicle, please arrive and setup before it gets dark. Don’t drive up to the telescopes after dark. 2. If you are a visitor without a telescope, park nearby, but not next to the telescopes. 3. No unannounced flash photography after it gets dark. Flash photography destroys night vision and can be extremely upsetting to astronomers and visitors. If you desire to take a couple of flash photos, please get permission from some of the astronomers and make a loud verbal announcement to the entire group of your intentions to forewarn the group prior to taking each photo. 4. NO WHITE LIGHTS! Because of the need for night vision, use only red-light flashlights. 5. NO ALCOHOL. Alcoholic beverages are not allowed at our events. CCAS star parties are family events. 6. NO SMOKING! We star gaze in a very dangerous fire area. And we don’t want smoke on our optics. 7. Closely supervise all children. This is not a play area. Only bring children who can understand and appreciate the stargazing experience. 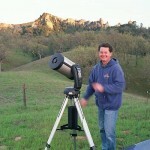 There is expensive equipment all over star party hill, with many tripped hazards. We highly suggest joining our email list, where you’ll get the latest information on whether a star party is a GO or NO-GO depending on weather conditions. We’ll also send you an astronomy guide to help you get started in your astronomy adventure!